You can have a lake that you fall in love with as a woman and not a girl, one that haunts you and hovers in your imagination. Lake Erie is that lake for me. I first met Erie in May 2016, at a writing retreat on Pelee Island, and it slowly started to work its way into my heart, mind, and poems. 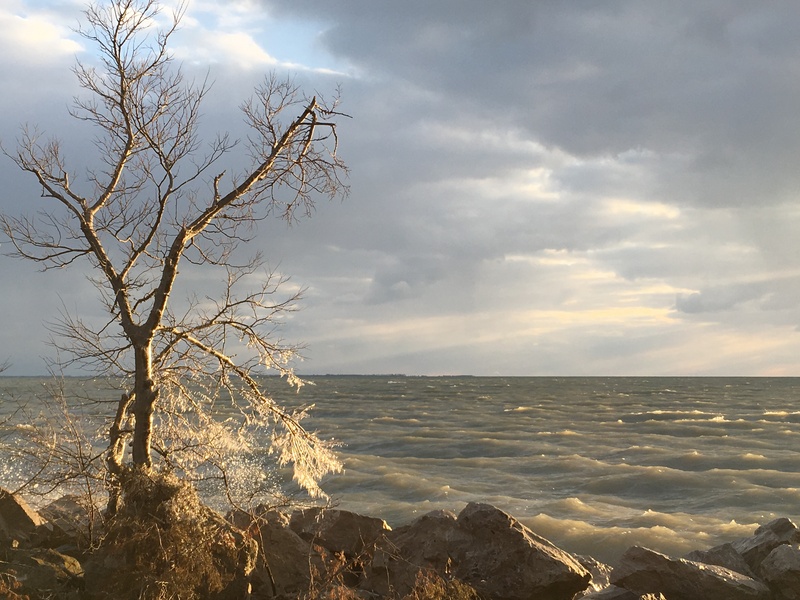 A writer friend took me to walk at Point Pelee National Park in August 2016, and she laughed as I stumbled along the trails, not looking at the ground, but instead transfixed by the leafy beauty of the Carolinian trees, the riot of birds, and then by the raw power of Lake Erie. I was smitten with a Great Lake. Growing up in Northern Ontario, I had spent some time around Lake Huron, mostly during summers on Manitoulin Island, but I had never lived next to a Great Lake. This year, taking a leave from formal teaching, writing the first draft of a novel and polishing a new collection of poems in Kingsville, I’ve walked at Point Pelee a few times a week. You can buy a year long pass in the late winter, for a reduced rate, and that’s the first thing I did when I arrived in March. My favourite thing to do is to stand on Sleepy Hollow Beach, or Black Willow Beach, or East Beach, and just watch the water, the sky, and the gulls dancing on air currents. I can do this for the longest time, and the lake makes me think of everything, and nothing, all at once. There’s a serenity to that, a peace that works on you slowly, patiently, from the inside out. As a writer, Erie speaks to me in strong ways. The words and phrases are woven into my mind now. My heart is full of the sound of its waves, and the way in which the water changes if you sit quietly, watching it for a long time. You need to be quiet inside. It demands that of you. And then you need to be patient with yourself, slowing down your breath and letting the lake’s energy pour into you. It feels sacred. What it does for me, creatively, is empty me out and then fill me up again. If there is a lake that will stay with me until my very last breath, Erie is that lake. It has woven itself into me in ways that I probably don’t even understand yet. It reminds me of that beautiful e.e. cummings poem, “i carry your heart with me.” The lines that I hear in my head when I stand with my dog on those beaches at Point Pelee are clear and true: “i carry your heart with me (I carry it in/my heart) i am never without it.” It’s rough, and raw, and stunning, this Great Lake, and it moves through you if you let it, transforming you and setting you to rights again. 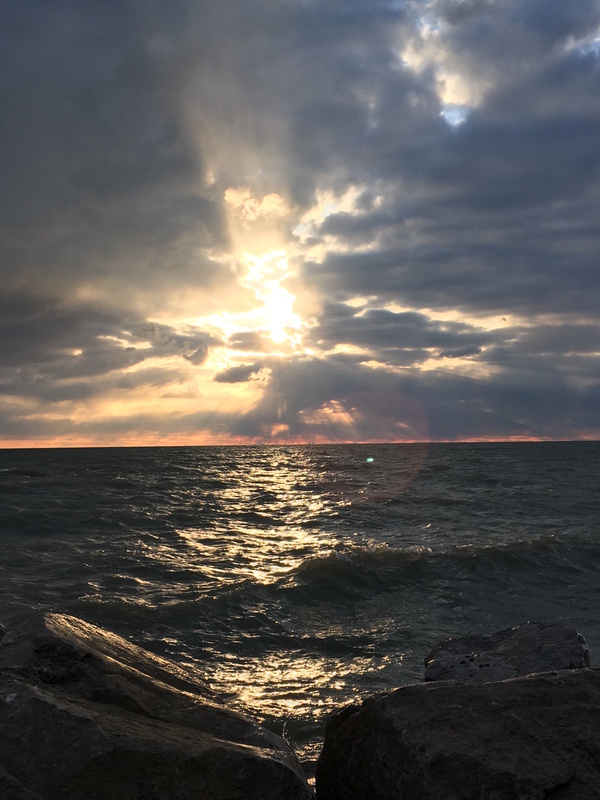 For as long as I live, Lake Erie will be my touchstone, my heartbeat. I’ll carry it with me, and I know it will carry me, with ease and grace, too.